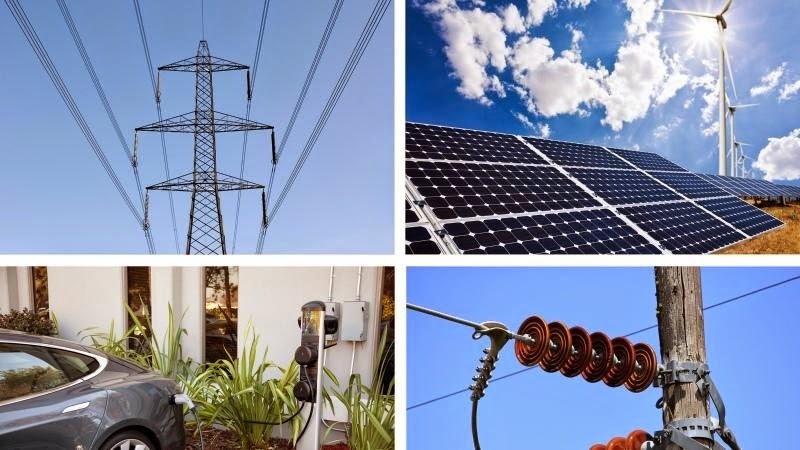 Saturday's energy news placed great emphasis on renewable energy strategies from across the world, but with the General Election fast approaching we can be sure that this is going to come under further scrutiny in the weeks to come. 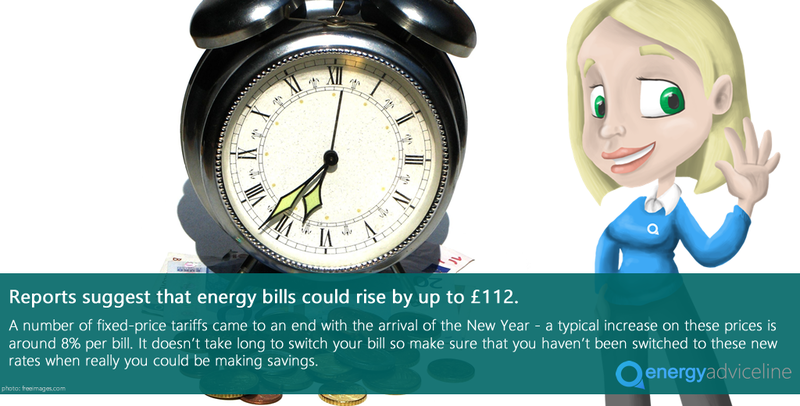 Sunday looked more to how we can improve our energy usage within our own homes and businesses - after all, the easiest way to start saving money is by changing a few habits around the house. Small and medium-sized firms have been urged to check their energy tariffs and compare them to the best deals on the market, following a new survey showing rising energy costs are impacting heavily. 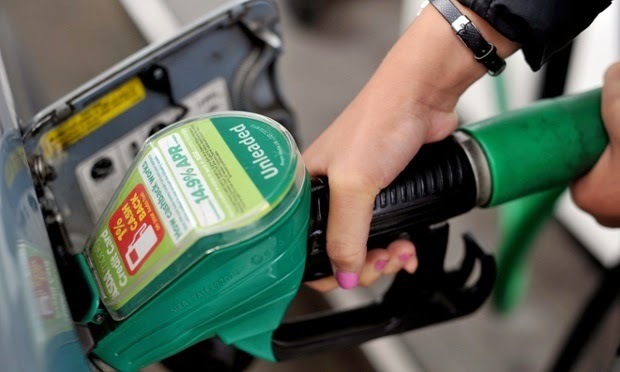 The Energy Advice Line, the UK’s leading price comparison and switching service for energy consumers, said the majority of firms were feeling the effects of high gas and electricity prices and needed to switch supplier regularly. 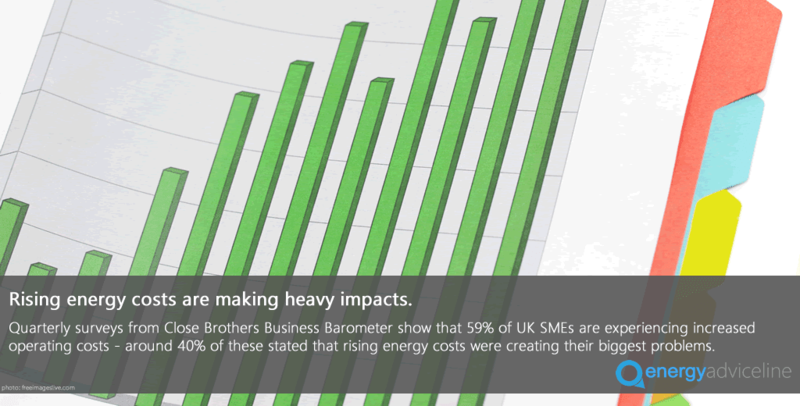 The Close Brothers Business Barometer, a quarterly survey of SME owners and senior management across a range of industry sectors, found that more than half (59%) of UK SMEs were experiencing increased operating costs. Over half of those firms said the increases were having a negative impact on their businesses, and of these firms almost two-fifths said that rising energy costs were creating the biggest problems for them. Again this week the majority of the energy news came on Sunday, with talks of the UK heading towards deflation. Costa Rica have hit a fantastic milestone, being able to power their country for 75 days using only renewable energy - this will definitely help towards getting more research done around this area. Theirs was supplied thanks to heavy rainfall, which is something we all feel like we can relate to in the UK sometimes! Increasingly shrewd energy consumers were exercising their rights and challenging poor service by suppliers, according to the Energy Advice Line. Julian Morgan, managing director of the price comparison, switching and advice service welcomed new figures showing a massive increase in the number of disgruntled customers lodging complaints against energy companies. But he said it was disappointing that customers still had so much to complain about at a time when Ofgem was supposedly reforming the energy market with the best interests of consumers in mind. According to the new figures, complaints to Ofgem have almost tripled over the past year as bills soared and the energy market came under the political and regulatory spotlight. 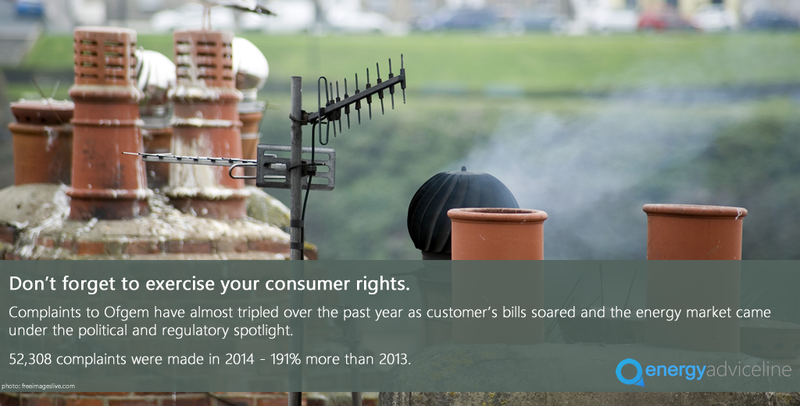 A record 52,308 complaints were made in 2014 – 191% more than in 2013 and over four times the number received in 2012. 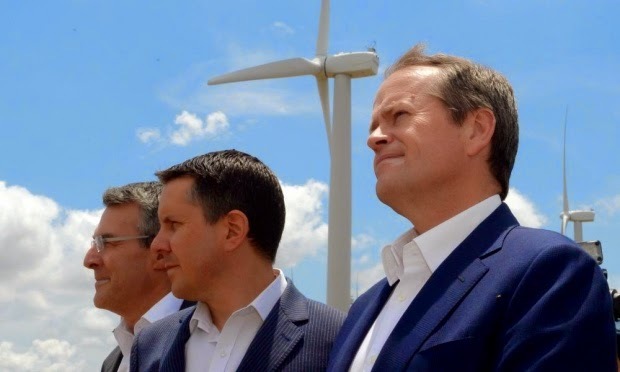 The majority of the energy news this weekend all came on Sunday with talks beginning to lean more towards the upcoming election and each party's stance on renewable energy plans. On the more lighthearted side of things, Japanese scientists have discovered that it's possible to get yourself a cup of tea in space! The Energy Advice Line has urged the Big Six suppliers to extend their My Energy Credit reimbursement scheme to business gas and electricity users. Julian Morgan, managing director of the price comparison, switching and advice service, said the scheme, which helps consumers access money they are owed by previous suppliers, should also apply to non-domestic energy users. The campaign launched last September and extended this month, helps customers around the UK find out about money that might be owed to them. According to suppliers, millions of pounds have already been reunited with their owners. Experts estimate an average 3 million householders are owed an average of £50 each after closing an account that was in credit. Saturday's news focused largley around the ongoing issues of domestic energy users being unaware of the amount they are able to save on their energy simply by switching their supplier. In particular, it's young people who aren't being savvy enough with their spending so awareness needs to be raised in order to help them save money. Sunday's news was all about the suppliers and how competitive their prices actually are. The Energy Advice Line has warned energy consumers to be vigilant about the amount they pay for their energy as new figures showed an increase in the number of customers in debt to energy suppliers. 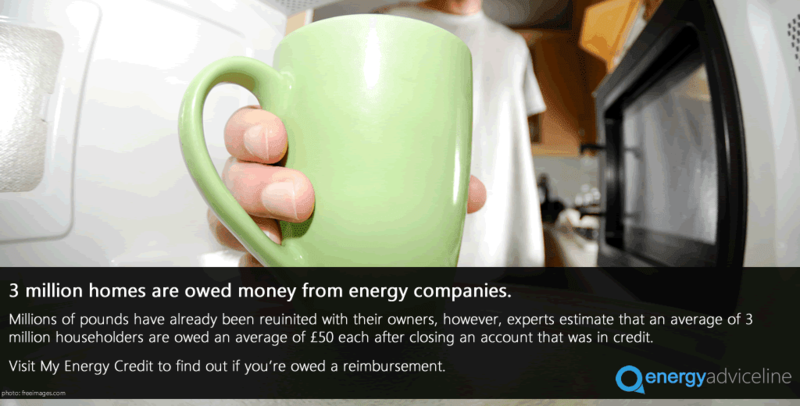 In its Domestic Suppliers' Social Obligations 2013 annual report, Ofgem found that the total number of customers accounts in arrears rose in 2013, although the amount owed was similar to the previous year. 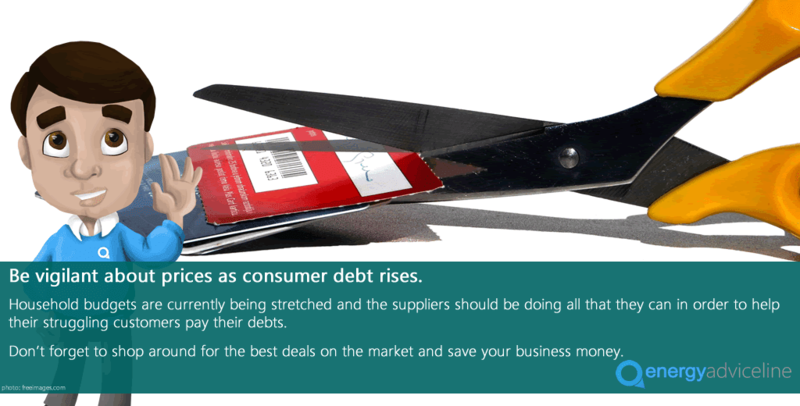 The report said that with household budgets stretched, suppliers should be doing all they could to help struggling customers pay. Julian Morgan, managing director the Energy Advice Line, said it welcomed the energy regulator’s plan, outlined in the report, to investigate how suppliers communicated with customers who were in debt. There was a lot of focus this weekend on the energy comparison sites that operate in ways to benefit themselves, as opposed to the customer who is trying to save some money. The best way to avoid this is to use a reputable energy comparison and switching service such as the Energy Advice Line. Energy efficiency was the main focus of Sunday with more stories about alternative energy, and the potential for changing the type of lightbulbs in the home. 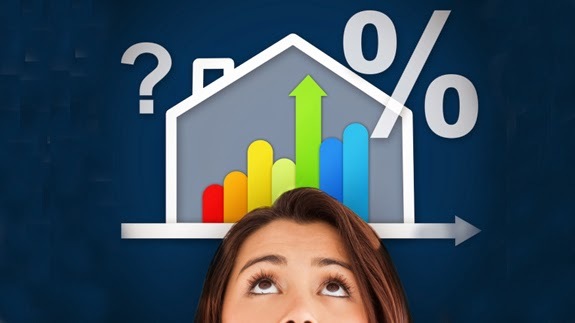 Have You Made the Most of New Year Deals? The Energy Advice Line has urged consumers to shop around for new energy deals following reports that many popular fixed tariff products will come to an end on December 31. Julian Morgan, managing director of the price comparison, switching and advice service for energy users, said reports suggested bills could rise by up to £112 for some consumers. “It’s very important for consumers not to turn a blind eye to their energy bills at this time of year because many fixed deals will be coming to an end during the festive season,” Mr Morgan said.